With this first e-Lumini blog we proudly announce the launch of our open source Change Mandala Project. Likely to be a first of its kind, this project aims to build a global community of business change and transformation experts to drive and inspire the development of a new strategic framework. In the spirit of Open Source principles, we believe that the framework can become richer, more powerful and deployment-friendly by sharing it openly with such a community. By exchanging both our professional and personal ideas, observations and experiences freely, we believe that all of us can learn more about how better businesses and communities can be build. When we conceptualised the Change Mandala’s first iterations in 2014 we were looking for a simple, flexible and industry-agnostic tool to structure our organisational change, business transformation and organisation re-design assignments. We wanted to develop a framework that would make our assignments inspirational for all our client people. It was to be one that would invite functional leaders and experts to interact more efficiently and constructively in the change, transformation and redesign of their organisation. It would rely equally on creative and analytical thinking to better align any organisation’s internal workings with the expectations of its environment. Ultimately, we wanted to introduce a framework that would help our clients improve their competitiveness sustainability by leveraging the typically unique perspectives employees, vendors, partners and customers have of their organisations. One of the Change Mandala’s most fundamental design criteria was that its design and underlying methods needed to do more than inform organisation change. Instead, the framework needed to inspire change and transformation. To make it so, we believed that we, as management consultants, had to become facilitators rather than the lead engineers of our client’s change. Therefore, the model needed to be driven and supported by principles that could be understood by all participants. Its terminology had to be simple, presented in plain English and therefore free from confusing business, strategy and consulting jargon. Once participants understood the meaning of each of the Change Mandala’s components, they could take control over their configuration – first in concept, and later in real life – which would allow them to take full ownership over their organisation’s change and transformation efforts. We believed that if we were make our Change Mandala session safe enough for participants to bring their most honest views, opinions and perspectives on their organisation to the table, we would help to inspire the creative thinking that was required to incept true strategically-differentiating change and transformations. It would allow broadest-possible audiences, including client employees, partners and customers, to architect the redesign of their organisation’s change and transformation. Since we introduced the Change Mandala in 2014 we have been given some very exciting opportunities to test model’s merits in real life. When we deployed it as our change management framework at some of our largest clients, we used it to identify how the changes we proposed in one functional area would affect workflow continuities in others. We successfully used the framework as a test lab to conceptualise how the adoption of attractive strategies would affect our client organisations and, conversely, how their organisations could be reconfigured to optimise the execution of these strategies. To accelerate mergers and acquisitions, we used the Change Mandala to compare the workings of the merging parties, and to explore how differences should either become synthesised or preserved. We also found the Change Mandala useful when we advised small businesses and startups. It helped entrepreneurs to identify the resources they would require to achieve their business building plans, and highlighted the strengths and weaknesses in their ideas and visions. They felt that the Change Mandala allowed them to retain full control and ownership over their business development efforts. 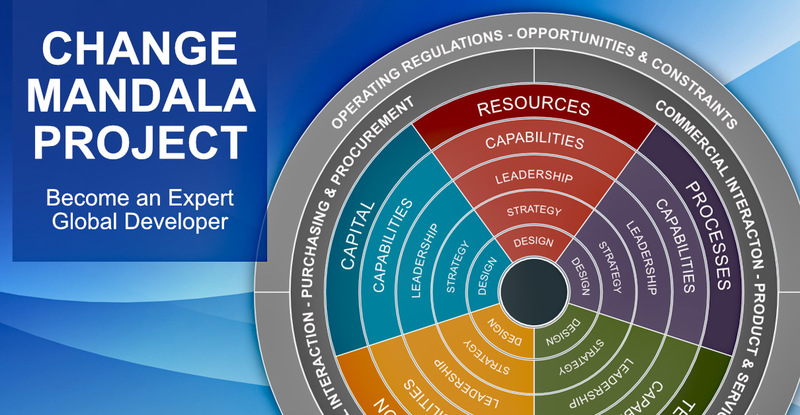 Although we have been able to test the Change Mandala’s framework throughout real-life management consulting engagements, we believe that we’ve only started its development journey. While acknowledging that, like any other model, approach or technique, it will never become a definitive answer to all business change, transformation and redesign needs, we do feel that the model’s principles are strong enough to invite new applications, new approaches and new ways for deployment, some of which may prove to be useful for a much broader range of businesses, sectors and industries over time. Currently, the only roadmap for the Change Mandala’s development lives in our own heads, driven by a torrent of notes, taken at each session, on how the framework could be improved. Rather than keeping its development constrained to our own thinking, we have come to believe that the Change Mandala can become most powerful when it becomes co-owned by a global community that includes participants from any walk of life. To develop such a community, we are now looking to connect with anyone who has a professional interest in organisational change, business transformation and organisation re-design. We welcome top executives to contribute their senior leadership perspectives on organisational change, business transformation and organisation re-design. We would like to receive the insight management and business consultants can provide on corporate strategy, organisation change and business transformation. We anticipate that, over time, the Change Mandala’s development will receive more comprehensive contributions from true experts and practitioners across HR, Legal, ICT, Finance and Marketing disciplines, for example. We hope that the global Change Mandala development community we aim to build will continue to expand over time, and will include an increasing number of exceptionally valuable contributors. As a co-developer, your role will be voluntarily; you contribute to the Change Mandala’s development when you want and can. You will receive full access to the toolkits we will be developing, and are free to use the framework as you see fit. Likely, we will publish ‘how to’ tutorials on how to use the Change Mandala, and will publish user guides and manuals that can be used by faciliators and participants to accelerate their change and transformation programmes. A Developer Community Forum is nearing completion, which will allow you to exchange valuable insight on the framework’s use, as well as to receive support and advice from more seasoned Change Mandala Practitioners. Perhaps best of all, membership to our Registered Developer community is completely free or charge. As we build our toolkits, we will be sharing them with you at no cost. If organisational change, business transformation and corporate strategy are of interest of you, we would like to invite you to join our Change Mandala Developer Community. Whether you are a management consultant, business advisor or executive, we expect you’ll bring the new and creative perspectives we need to progress our development work.